A stela is a sculpted stone monument with carved figures and inscriptions. The Maya often placed stela before temple or palace entrances. The one on view here was found at the portal of the main group of buildings in the Maya site of Oxkintok, Mexico by archaeologists from the Carnegie Institution of Washington in 1940. A 1940 excavation photograph (click on "view all images" above) shows the Gallery's largely intact stela in the location where it was unearthed. This photo also shows that since its excavation in 1940 and before it was purchased by the museum in 1967, the stela suffered damage by unknown hands. The fragment of the upper panel visible in this photo was broken off and is now missing. Also damaged were the glyphs (Maya writing) between the knees of the figures, which lost some of their surface carving. 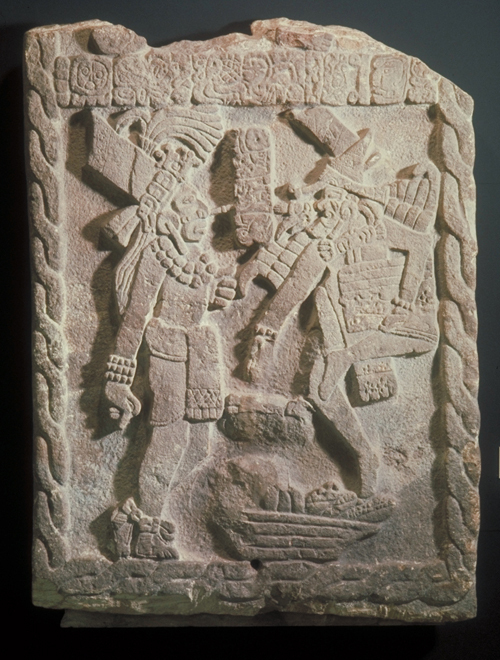 What remains of the stela shows two elaborately dressed dancing figures who face each other. Three bands of glyphs are visible: the long horizontal band along the top, a vertical row between their faces and one horizontal row between their knees. The horizontal row of glyphs across the top contains the date of October 9, 859 CE. Both smaller rows are now badly abraded and difficult to identify, but the first two glyphs in the short vertical row between the figures may identify the name of the individual standing on the left as "White Jaguar." This figure is a youthful ruler or noble, possibly in the guise of one of the legendary "Hero-Twins" who in Maya mythology traveled to the Underworld to overcome its lords. The figure on the right has been identified as God N (Pauahtun), one of the principal Maya lords of the Underworld or region of the dead. He wears feathers on his arms and carries a codex, or folding-screen book, of bark paper with a jaguar-pelt cover. Below Pauahtun is a bowl or basket containing unidentifiable objects. The upper panel that was attached to the stela in the 1940 excavation photo may have depicted an elaborately dressed dancing ruler in the world of the living as a counterpoint to the Underworld scene visible here.